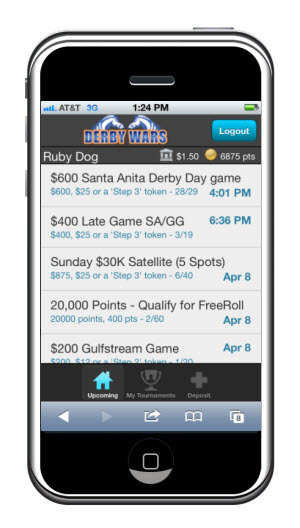 Players have been asking for the DerbyWars mobile app, and it is now available in Beta at www.derbywars.com/mobile. The app is for iPhone, Android and other smartphone devices. We will be making several improvements to the app over the next several weeks, but we wanted to get the app out for players to use. Currently, the app is in Beta, and recommended for experienced DerbyWars players at this point. 1) You will be unable to bet on an entry (1 & 1A, for example) if one of them is scratched. 2) The mobile app may not work for Blackberry users. We look forward to making further improvements to the app and we look forward to your feedback! The link seems to be broken, nothing comes up when I click it. Thanks for this amazing post!! It was a pleasure reading this article!! i would like to know more about this post!! keep posting!!! I just love the app. Its pretty cool app. really a nice information, worth reading.it. thats a great piece of content, thanks for it.